Recent science fiction movies always show people sitting at stylish semi-transparent desks that have all kinds of strange and wonderful gadgets in them. Our desks look like something your grandfather might have sat at. [Frederick Vandenbosch] must have seen those same movies so as part of contest he decided to build the desk of the future. The desk is as much a furniture project as an electronics project, but it does have a Raspberry Pi, a scavenged laptop LCD, embedded touch sensors and LEDs, a wireless charger, and a built-in sound system. In addition, it uses a Gertbot and some stepper motors that it uses to raise and lower the screen in and out of the desk (watch the video below to see how that looks). [Fredrick] used Python to get the major functions of the desk programmed. We couldn’t help but think of all the things you could do with an easily programmable desk surface: show stock quotes (or sports scores), notify about e-mail, or other things. Although it doesn’t look like it would be simple for a simple user to add those things, if you were a handy programmer, they look like they’d be in reach. We’ve seen some desks before, but nothing quite like this. We couldn’t help but wonder if you could add some Minority Report-style goodness to [Frederick’s] already impressive desk. If you’ve ever typed for a significant amount of time you know that it can become painful. Long term exposure can cause wrist and arm injuries. There are some things that can help alleviate the risk of injury like taking frequent breaks, good posture and using an ergonomic keyboard. [Ian] likes the feel of Mac keyboard keys but doesn’t like the traditional straight layout. Unfortunately, Apple doesn’t make an ergonomic keyboard so [Ian] stepped up to the plate and made one for himself. Just starting this project was an extreme pain. Apple glues their Mac keyboards together. A heat gun was used to melt the glue to 400°F as kitchen utensils were stuck in between the halves of the case, keeping the glue from re-sealing the case together. Once the case was apart the unnecessary keys were removed. [Ian] is actually modifying two keyboards into one because he wants the middle keys to show up on both sides of the keyboard. With the necessary keys identified, the metal support frame was removed from the unneeded sides of the keyboard. If your had keeps cramping while using the computer mouse why not grab a hunk of wood and a couple of buttons to make your own ergonomic input device? Here’s a Windows GUI for controlling Arduino. [Rohit] put it together using C#. It should make development very simple as you have control of almost everything before you need to worry about writing your own server-side software. [Jeremy] got tired of replacing the halogen bulbs in his office. He upgraded to ten meters of RGB LED strips. We can’t think they do as well at lighting up the room. But he did add network control so they can flash or change colors depending on what type of alert they’re signalling. Now that [Andrew Kieran] proved you can weave a working QR code into textiles do you think we’ll see garments that have a QR code leading to care instructions? We could never figure out what all those strange icons stood for. The world’s largest QR code was cut out of this field of corn. It’s at the Kraay Family Farm in Alberta, Canada. Gizomodo called it “Stupidly Pointless”. But we figure if it got them a world record and put their website on the front page of Giz and Hackaday they’re doing okay. Plus, we whipped out our Android and it read the QR code quite easily. As the most direct interface between computer and programmer, keyboards can be a deeply personal, sometimes almost religious thing. Some find solace in their vintage IBM Model M, or luxurious leather keyboard, but maker [Carol Chen] took things into her own hands, quite literally. 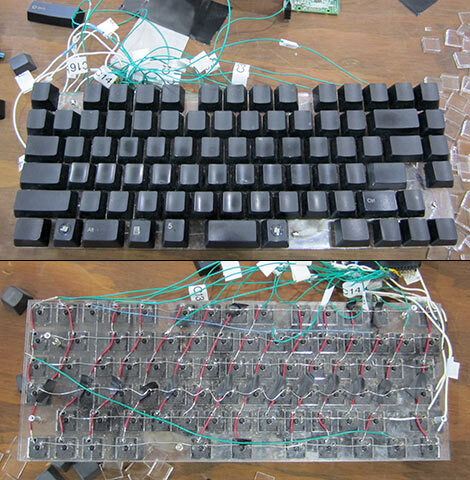 [Carol]’s Maker Faire exhibit has a half dozen specimens of interesting commercial tactile and ergonomic options…but [Chen]’s personal keyboard, where she commits to her work as a full-time coder, has been made to her own exacting specifications.